While grasshoppers can do significant damage to a farmer's crops, without these insects the ecosystem would be a much different place. They play a critical role in the environment, making it a safer and more efficient place for plants and other animals to thrive. In fact, even a change in a grasshopper's mood can alter the ways in which he benefits the environment, reflecting just how dependent on the jumping insects our ecosystem is. The grasshopper benefits humans and the ecosystem in general by facilitating plant decomposition and regrowth, creating a balance between the types of plants that thrive. Despite their small size, grasshoppers consume enough plant life to influence the types of plants that subsequently grow. 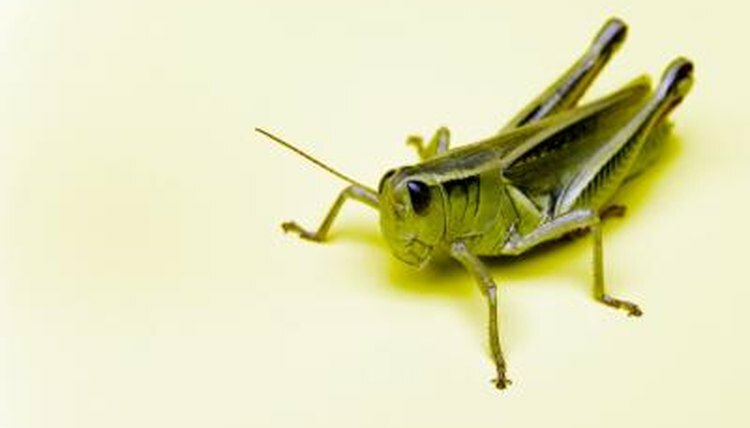 This influence is evidenced by a Yale University study that reveals how a mood-based changes to a grasshopper's diet affect the environment around him. Sometimes, when a grasshopper dies, microbes in the soil easily break down his nitrogen-rich body, enriching the soil and helping carbohydrate-rich plants to grow. When the grasshopper experiences a fear trigger, though -- like in the presence of a spider -- he consumes more carbohydrate-rich foods. Then, when he dies, the microbes have more difficulty breaking down his body, and nitrogen-rich plants grow instead of carbohydrate-rich ones. The grasshopper benefits the ecosystem by facilitating plant growth, as evidenced by his ability to noticeably change the types of plants that thrive in his environment. Just like any other insect or animal, grasshoppers excrete waste after eating. That waste is highly beneficial for fertilizing the soil and facilitating plant growth. Think of it this way: in a field of a half-dozen cows, the bovines create large piles of excrement that microbes slowly break down to fertilize the soil. In that same field, however, hundreds of grasshoppers are also producing excrement, and in much smaller amounts. The reduced size of the waste allows microbes to break it down more efficiently, fertilizing the soil faster. While the grasshopper may not appreciate this particular role that he plays in the ecosystem, he is a vital source of food for predators in the wild. He benefits the environment by feeding creatures like spiders, birds, lizards and more, allowing them to survive and fulfill their own roles in maintaining a healthy, vibrant ecosystem. Without the abundance of grasshoppers, these other creatures would not have the same access to food that they enjoy now, and may face dwindling numbers. According to the U.S. Department of Agriculture, grasshoppers generally consume 10 percent of available plant biomass -- or even more. This means that the grasshopper plays a vital role in preventing plant overgrowth in the environment. While the insect's appetite can wreak havoc on farm crops, in general, it also benefits the environment by maintaining optimal levels of plant growth. Depending on the weather conditions and the grasshopper population, though, too much of a good thing can turn devastating. For example, when the weather is hot and dry, it slows the regrowth of eaten crops, making it difficult to recover from a grasshopper feeding frenzy. When their numbers are too high, the ecosystem loses balance -- if the crop area has more than eight grasshoppers per square yard, or if a field or waste area has more than 21 per square yard, an insecticide treatment may be necessary.